Having metal siding installed at your home in Rio Rancho, New Mexico, or a surrounding area, can help protect your home against all of the elements experienced in the region. 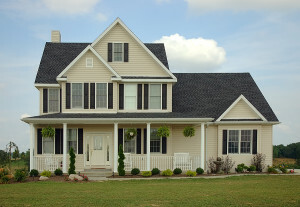 We have been in business since 1989 and have proudly served the area with highly durable siding that will last for years to come. On-site fabrication – Our seamless steel siding is constructed at your home to ensure a perfect fit from side to side of your home. Customization options – Our siding comes in either horizontal, log, or board and batten style with a huge selection of colors available to select from. Low maintenance requirements – The cladding we offer is created with a Kynar 500® finish so that you will no longer need to worry about painting your cladding. Furthermore, the reason that our metal siding is so much stronger than any other style of cladding is because it is constructed from 28-gauge, hot-dipped, G-90 galvanized steel. This style of siding is the strongest cladding available on the market today. For more information about our impressive metal siding options that we have available to homeowners in Rio Rancho, NM, and the surrounding areas, contact the experts at ABC Seamless of Albuquerque today.